Clear all 57 jellies, bring dawn all ingredients and reach 50000 points to complete the level. This level has medium difficulty. 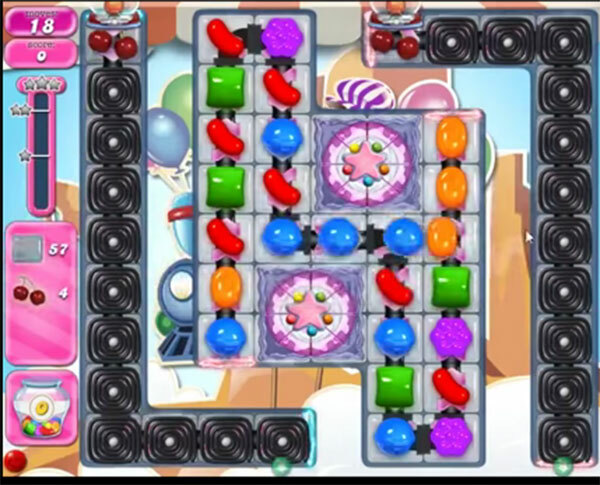 For this level try to play near to cake as it will help to break the blockers. Or play near to cake and make special candy as you get the chance. Combine them with each other to break more blockers and to move ingredients. 1708 completed! 2 boards! Break cake wheels. 1708 completed! 2 boards! Break cake wheel. 1708 completed …used candy hammer x2 to get this . Why do I get bombs ? They are making this game twice as hard ! Only 15 niveau and I have to clear all the bombs to coeur the Jelle . All that in only 15 movies is practicly impossible !!! Ik heb ook maar 15 zetten en niets dan bommen achter de drop onmogelijk om dit te halen. Please help me…y can’t do it! I have 15 moves how can I break cakes? can’t make stripes? ?